What’s the fastest (and most legit) way to make money online? The answer is client SEO. It isn’t for people who are looking for a get rich quick scheme. 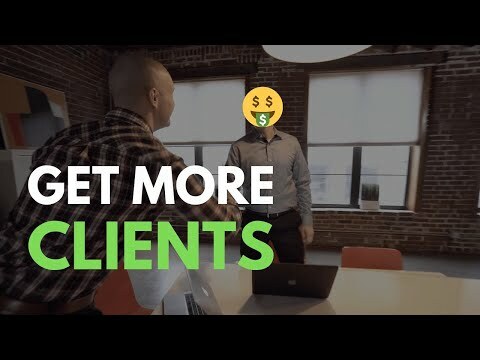 Succeeding in client SEO is hard work, but it’s worth it if you’re serious about making more money online. You’re serious about starting or growing a REAL business. Getting SEO clients took me from a broke college student that was $40,000 in debt, to making multiple six figures in less than 6 months. I had no prior business experience, I sucked in school (2.6 GPA), and I had never sold ANYTHING. All I had was the ability to rank websites in Google. So, if you want to build a career in the SEO industry by helping business get more organic search traffic, then this video is for you. 1:46 – Client SEO vs. niche websites: What’s better? 16:58 – Discover my Outbound System for getting new clients. These methods are incredibly powerful for anyone trying to land their first client quickly. 35:07 – How to convert your leads into paying SEO clients by using my simple step-by-step sales process. The best part is that you’ll close leads without being salesy or over-the-top when you use the system I’ll show you. 48:03 – Learn how to retain 95% + of your clients. Most people think retention is about customer service, but they’re wrong. There’s something far more important. Enjoy the video and let me know what you think in the comment section! ❗️ Disclaimer #1: My results are not typical. Hey Nathan, Loved the content and really appreciate you sharing such valuable content with us for free <3. I was wondering if we could get the list of deliverables and the 1-6 months SEO plan for clients which was mentioned in the video will be available for the download. I downloaded the Bonus attached in the video description but it doesn't include those deliverables and plan for 1-6 months. Taking action on what you study and turning that into knowledge … yes. Really enjoy the content you're putting on here. Keep it up! Love the free strategies, Nathan. Thank you so much for sharing such great content! Awesome video. Really enjoyed it. You’ve inspired me to start my own SEO and Marketing agency, HeadStart Digital in Dallas a little over 3 months ago. We’ve on-boarded 4 clients within the last month.